In assembly of a working cable, The right tool for a job makes all the difference when building connectors and cables. Such an important function relies on durable and reliable materials, manufacturing, and design. 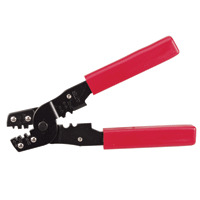 This Multi-Purpose Crimper Crimps a Variety of open Barrel Connectors including Solderless Lugs and D Sub Contacts AWG 28-14 . Multi-Purpose Crimper, Crimps a Variety of open Barrel Connectors including Solderless Lugs and D Sub Contacts AWG 28-14 .